Canisius College announced that Kimberly L. Beaty (COM ’86) will act as the college’s new director of public safety. Beaty served as deputy police commissioner of Operations and Homeland Security for the Buffalo Police Department. She has worked with the Buffalo Police Department for 31 years. Beaty has received an abundance of awards for her efforts in the police department. She is a member of the New York State Association of Chiefs of Police, New York State Women in Law Enforcement, the Afro-American Police Association of Buffalo, NY, Inc., National Organization of Black Law Enforcement Officers and the Erie County Law Enforcement Foundation. 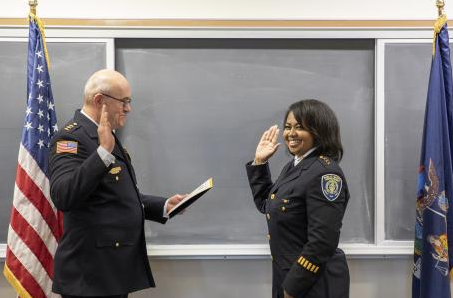 She also serves on the Erie County Law Enforcement Board of Directors. To read more about Ms. Beaty, read a profile on this COM alum in The Griffin from one of our current COM students, Michael Berg.